Happy Wednesday, can you believe that it is almost the end of October? I am still editing my trip photos: upcoming photos will include a series of Michigan flowers and mushrooms I found along the way. Today we are visiting The Curio Fair tower, located just outside of St. Ignace, Michigan. The tower climb is very entertaining , and the views of Lake Michigan and the Mackinaw Bridge are pretty spectacular. The Curio Fair building is pretty cool, the doors are heavy steel and the walls are rock and embedded sea shells. The gift shop on the main level is packed (walls/ceilings) with so may things,,,it would take hours to sift through everything. Although I do not usually purchase souvenirs, this day I did purchase some Guatemalan worry dolls, to remember my trip and gift to others. When life gives you shells…Decorate! After ringing up our purchases and paying a small fee, we were directed to a door at the back of the room, where we started our climb up several levels to the top of the tower’s viewing deck. One thing is immediately apparent, graffiti is encouraged and lots of people do it. I didn’t, because once again I did not want to burden myself with anything but my camera. No change, no camera, some girl scout I am. My party and I stopped frequently to admire some people’s artwork and others’ sense of humor. One bonus stopping frequently has, is that it helps take your mind off the fact that you are continually climbing up, and that the whole structure feels like it is swaying with the wind. Once at the top there are many windows in which you can securely view the Mackinac Bridge, as well as the surrounding lake and countryside. Or if you have the nerve step outside on the viewing deck, the views are pretty nice from this vantage point. All in all we had a great time and saw some new and unusual things in the gift shop. All it took was an hour or two of our time, a few dollars and we created some lasting memories; Isn’t that what we are all trying to do? As always I hope you enjoy the photos. I just finished editing another batch of Michigan photos, lucky you. 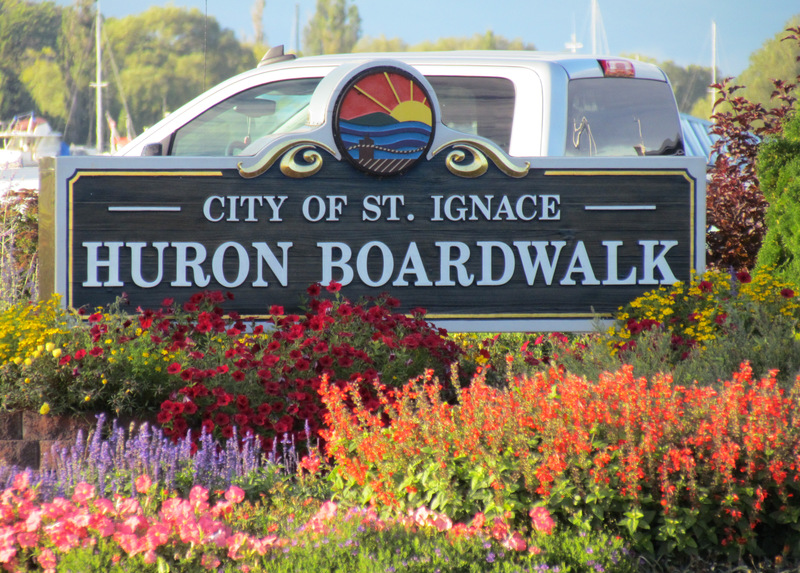 As you will remember I was on a Family Event Holiday… and took a chance to visit some touristy Michigan hot spots. 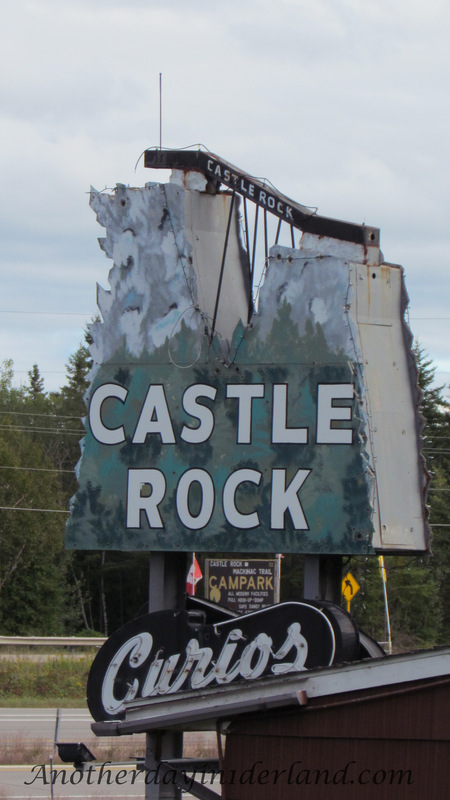 This day my companions and I decided to visit a childhood favorite Castle Rock. 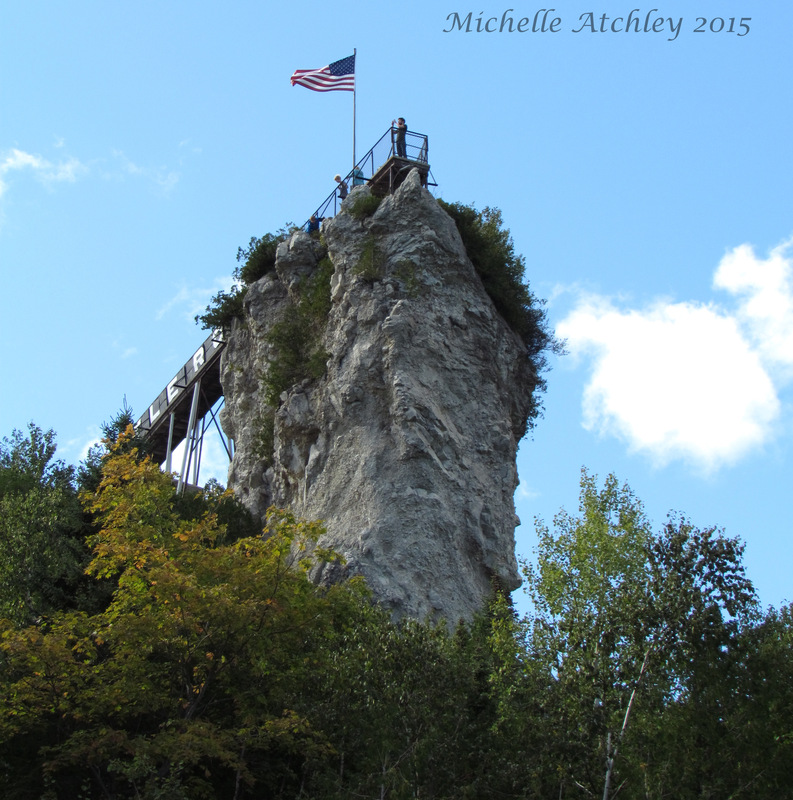 Located a few miles north of St. Ignace, Michigan, this world famous, 183 foot stair climb to the top of castle Rock, is a must do for any die hard, cheesy tourist spot fan, like me and my friends. We had so much fun, we climbed Castle Rock twice ……it was much easier the second time. 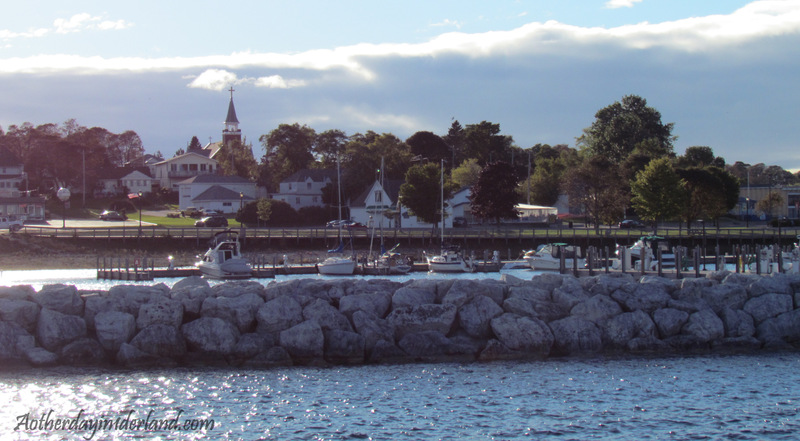 The views climbing the incredibly steep stairs, up toward the gigantic rock are gorgeous, but the view from the top is spectacular; you can see Lake Huron, view the Mackinac Bridge and see Mackinac Island from this point. These are the days when I wish I had a better camera, with a bigger lens, someday. Reaching the top, after a few rest-stops, my phone started ringing, we see there is a short walk out to the actual rock formation, that literally made me forget I am afraid of heights. As we stepped up to look over the platform, we could see coins everywhere that visitors toss over the sides as they make their wishes. And yet, can you believe we all reached the summit with no coins in our pockets? We quickly considered the long way back down, and decided to collectively to forego any wishing. The only thing that would have made this trip better would have been seeing the leaves changing colors throughout the trees from this view point. I will have to visit here again, maybe in October next time. I think that this very cheap and fun family activity is not for everyone, but if you can climb and breath at the same time, I encourage you to do it. If nothing else stop and get your photo taken near Babe the Big Blue Ox and Paul Bunyan, and maybe patronize the gift shop, the ladies that work there were so friendly and welcoming. All in all, this is a place that I enjoyed and could visit over and over. I hope you get the chance to go someday, and that you enjoy the photos I am sharing. It has been a very long time. I just returned from a trip up North to visit family and friends….as always I loved seeing everyone, but hate the eventual goodbyes. Regardless, though my time was very much spoken for with traveling and other activities, I still had the chance to sight-see and take a few interesting photos. 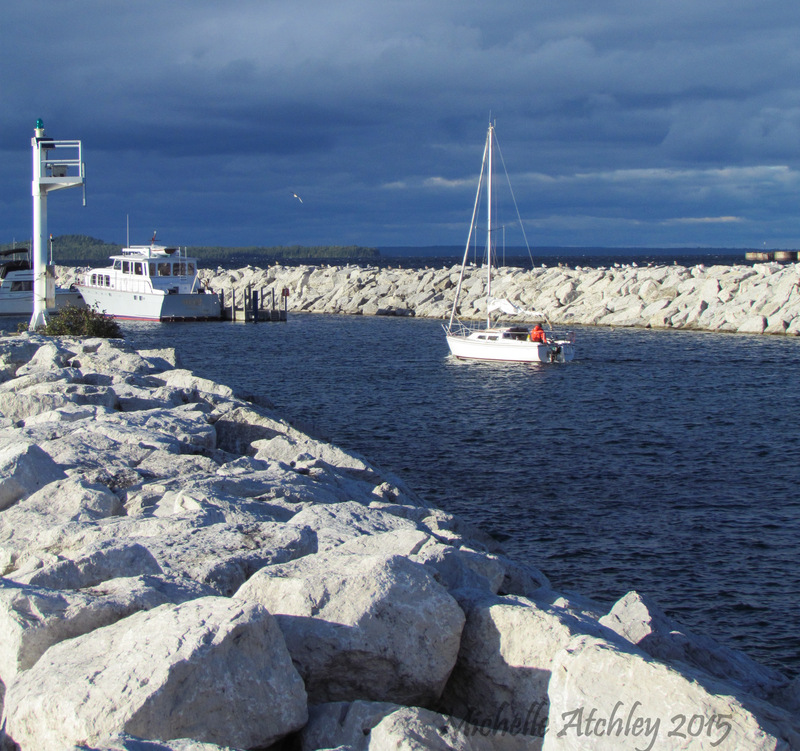 These were taken in St. Ignace Michigan, a small lake side city, just the other side of the Mackinaw Bridge. This town is something right out of a Norman Rockwell Photo. 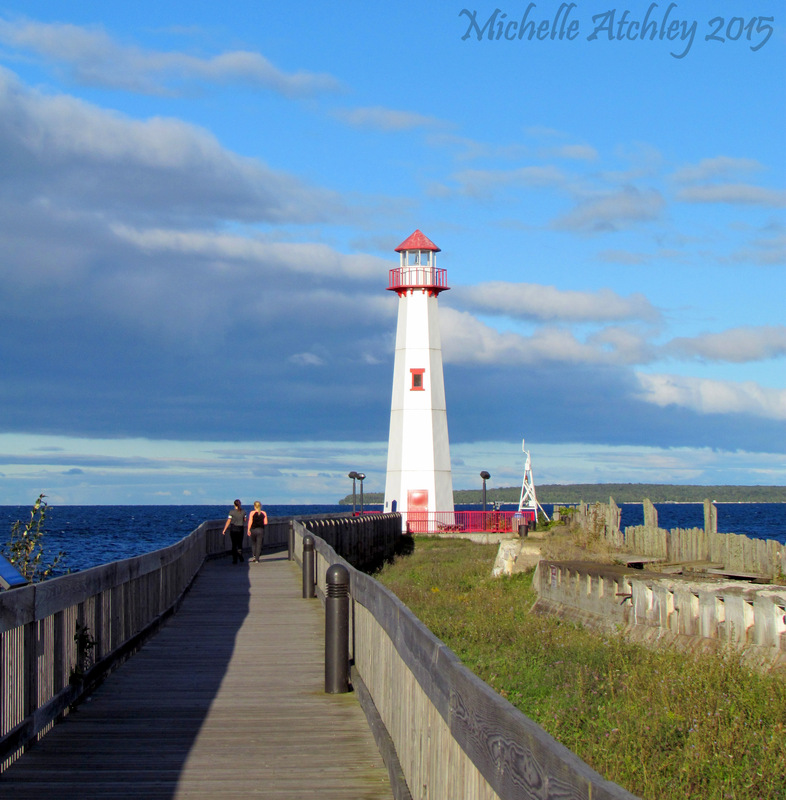 There is a beautiful Lighthouse right in the middle of town, surrounded by hillside houses and picturesque churches. I enjoyed my time here very much and even thought, if I did not have such an aversion to the bitter cold, I could die here. But I cannot even imagine the cold wind that blows off the great lakes here…it was September and the temperature was in the high 40’s, very brisk for this Florida girl. I could have spent hours trying to photograph the city, the lighthouse, which is directly across from Mackinaw Island, the crystal clear waters, but the sun was fading fast and it was getting colder. So I focused on what I could see and hoped I could capture how beautiful this little city was to me. So as always, enjoy!